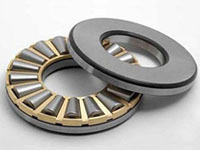 Thrust roller bearing separated type bearings of, which can only carry axial load and mild unidirectional impact, can limit axis (or shell) a direction, so the axial displacement can be used as a one-way axial orientation. But its carrying capacity is far greater than thrust ball bearings. Roller rolling, as the roller ends in different, make linear rolling ring road roller inevitably produce sliding, therefore, such bearing limit rotational speed is thrust ball bearings low, usually only suitable for low speed running occasion. 1. Carry axial load primarily axial and radial joint load, but shall not exceed the radial load 55% of axial load. Thrust roller bearings are used for heavy machine tools, high power Marine gearbox, oil rig, vertical motor machinery.